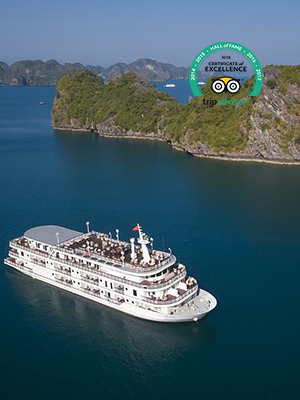 This meticulously designed steel vessel is known as the most comfortable cruise in the area, bringing to you the best quality adventure across Halong bay’s famous limestone caves and rugged islands. 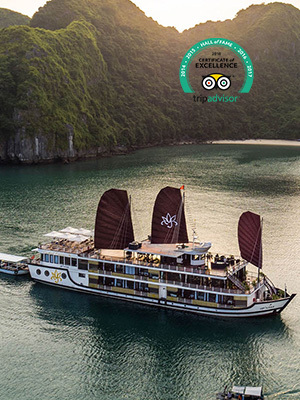 Tourist can afford either an overnight cruise – just enough time to experience the bay’s beauty or travel deeper into the bay with the 2-night cruise include Paradise Explorer tender excursion. 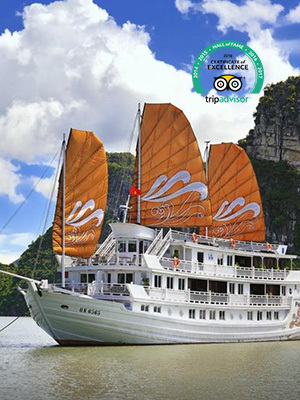 Not only by 31 capacious cabins, piano bar, day spa and specific butler service; but also by kayaking, visit floating villages and lots of water activities else, the Elegance offers you brilliant relaxation and joyful time throughout your journey along World Wonder Halong Bay. 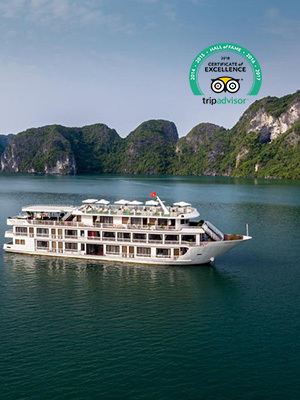 The cruise received thousands of reviews and recommendations for its five-star quality includes excellent food, first class accommodation and mostly for professional customers service. 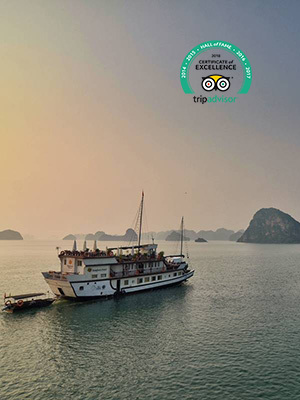 Embark at Hon Gai pier, you can expend 2 or 3 days on visiting Bai Tu Long Bay, the representative area of marine conservation in Vietnam which located in the East of Halong Bay. Without much public attention, Bai Tu Long Bay is relatively undeveloped and maintain its natural charming compare to the glamorous neighboring Ha Long Bay. Athena Cruise itself is splendid featuring every 21 luxurios cabins has its own private balcony, aiming to have you be blessed with tremendous bay’s sites. Present the mixture of contemporary luxury and historic heritage, this ship is being hailed by the name of The Ocean Princess to express its noble and exquisite. 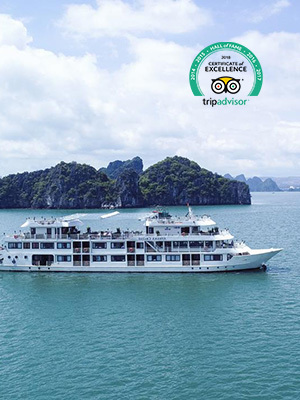 Depart from Tuan Chau habor, after a brief cruising exploration across Halong Bay, tourists will be astonished by the nature beauty of Lan Ha Bay when kayaking in Tung Gau area – where the Kong movie was filmed. 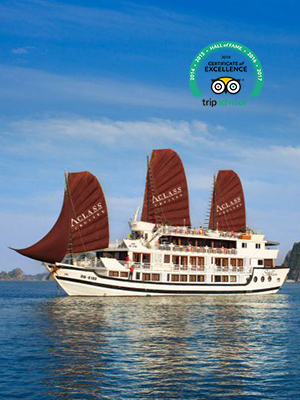 Providing profitable itineraries consist of day cruise and overnight cruise, with 22 private suite cabins, Jacuzzi tub and deluxe restaurant, daily organized cooking and Tai Chi classes, the gorgeous Alisa cruise commits to bring you superb experiences along with your pierce magnificent panorama of Halong Bay trip. If a slight craft with traditional style in which you can enjoy deluxe warmth and elegant ambiance is your thing, look no further than Aclass. 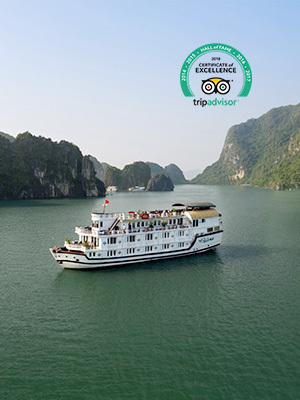 Once arriving Tuan Chau marina, you will be warmly welcome aboard before starting your journey around Halong Bay. 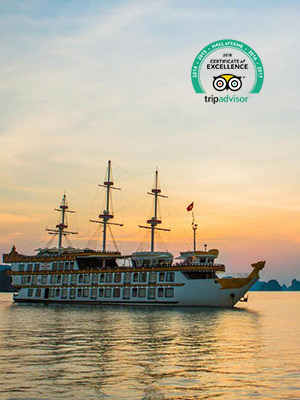 Proposing the alternative of signing up for a daily tour or staying over 1 to 2 nights, tourists can comfortably experience Halong spectacular landscapes, explore Sung Sot Cave, Titov Island area and sail through the calm emerald water heading to the Floating Village. 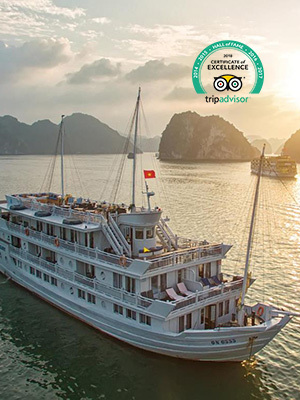 With only 12 well-equipped cabins but a topside bar and a gourmet restaurant, you can have your cruise to be lazy chilling on the sundeck or to be active joining swimming, snorkelling, and kayaking. 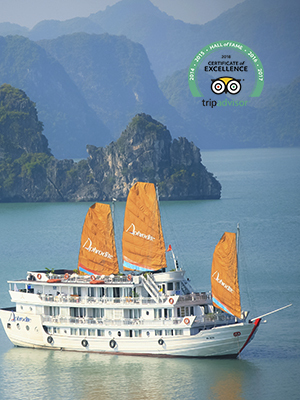 Dragon’s Pearl Junk is the bigger cruise option for groups in the Indochina Junk family. 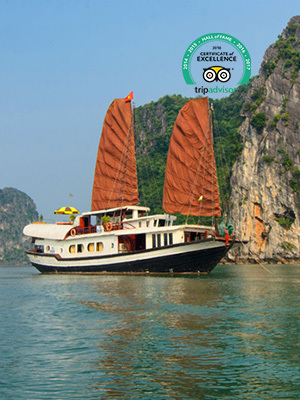 The 3 Dragon’s Pearl boats were modeled on the traditional Chinese junks which sailed long ago. The boat features 11 cabins and 3 decks with both outside and inside dining areas. Each cabin is beautifully decorated in a traditional style and equipped with modern amenities for a comfortable stay. Large sea view windows allow you to enjoy the fantastic landscape outside, from the comfort of your room. The sundeck on top will be a great place to view the bay at sunset and have an enjoyable time with your friends.